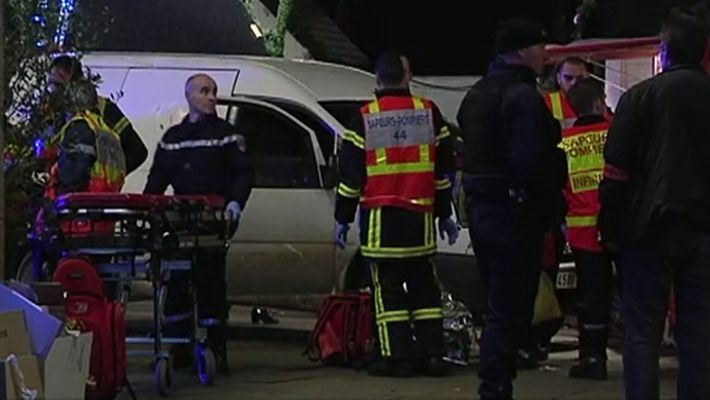 At least ten people were injured, two gravely, as a minivan crashed into a Christmas market in Nantes. The driver attempted to stab himself to death following the crash, a second such incident in the country over the last two days. Reports on the number of injured were conflicting with Le Figaro suggesting there are 17 casualties, while Focusur.fr reports at least 12 were injured and five are in serious condition. A 37-year-old man "deliberately" drove the van into the market crowded with families and kids, according to local media. After that he attempted to take his life, stabbing himself in the chest several times. A source close to the investigation told AFP that the man was seriously injured but alive. He was taken to hospital. Witnesses told L'Express the man was shouting "Allahu Akbar". However, there were conflicting accounts, with witnesses quoted by Reuters denying that these words were pronounced. While some media reports called the incident a “jihadist attack”, this has not been confirmed by officials. Local prosecutor Brigitte Lamy told journalists it was an "isolated case" and "not a terrorist act." Lamy said the driver was born in the western French city of Saintes, about 240 kilometers (150 miles) south of Nantes, but did not disclose the man‘s identity. The market was closed following the attack and the area was cordoned off. The incident comes a day after a mentally unstable driver also shouting "Allahu Akbar" ran into crowds of pedestrians in several separate locations in the French city of Dijon. At least 11 people were injured at that time, two of them seriously. French prosecutors said the Dijon attacker has had a long history of severe mental illness, receiving psychiatric care over 150 times in the past 13 years, and had no terrorist motives. They found no link between his actions and the Saturday attack in Joue-les-Tours, in which a 20-year-old Burundi national named Bertrand Nzohabonayo injured several policemen with a knife and was shot dead. Nzohabonayo and his 19-year-old brother Brice had reportedly made Facebook posts with radical Islamist statements, and attached Islamic State (IS / ISIS) flag images to some of the posts.